The 32-year-old man who was accused of starting several fires in Riverside County, including the destructive 7,500-acre Cranston Fire, grew up in Oceanside. 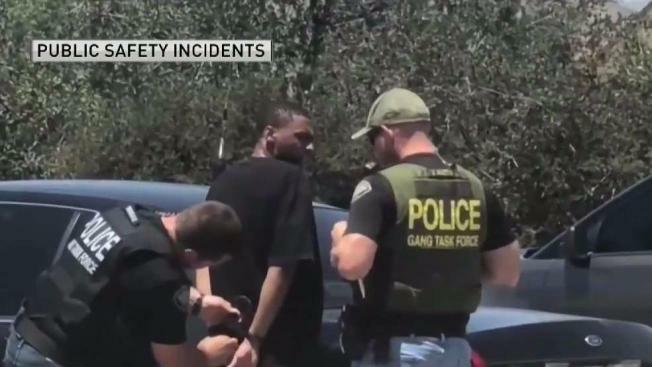 Brandon McGlover was taken into custody Wednesday after witnesses said they saw him leaving the forest area off state Route 94, between Hemet and Mountain Center, where the fire started, according to the California Highway Patrol. The spark took off with a rapid rate of spread and, as it burned, destroyed at least five homes and scorched nearly 5,000 acres of land by Wednesday night. McGlover currently lives in Temecula but spent most of his childhood with his two sisters in Oceanside. Former neighbors, whose children went to elementary and middle schools with McGlover, say he often played in the cul-de-sac with their kids. The neighbors, who didn’t want to be identified, say they couldn’t believe the little boy they once knew would do something like this. They say McGlover moved before high school after his parents got divorced. At the time of his booking into the Cois Byrd Detention Center in Murrietta, he was listed as a resident of Temecula. He was booked on suspicion of five counts of arson to wildland. He is also suspected of setting multiple fires in southwest Riverside County. More charges are possible as the investigation continues, according to Cal Fire. By Thursday morning the Cranston Fire continues to affect thousands of Riverside County residents. The 7,500-acre fire was 5 percent contained.